Not to be confused with World 2-6, Level 2-6, or Area 2-6. 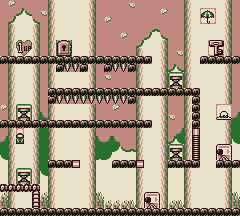 Stage 2-6 is the sixth level of the Forest in the Game Boy version of Donkey Kong. The stage features a large number of Dotties. Mario starts at the bottom the level where he must go left to pull the Switch that activates the bridges, open the door, and let out some Dotties. The goal is to get the Dotties on the first three platforms. Mario then must go left, climb up a Ladder, then jump on a Spring up to the platforms with the Dotties that he must jump over while going right to get to the next lever. Mario must then jump over a small gap to get to the lever to switch it just in case there are still some Dotties left. If all the Dotties are moved, Mario must jump onto a spring to get up the next platform which he must run across to the left without jumping because there are Spikes on the ceiling that hurt him if he touches them. He must then jump onto another spring to the next platform where he must head right where there are two pairs of spikes on each side with a opening in the middle. Then, Mario must jump on another spring up to the Key to the right, then grab it. He must then go back down to the spring and go left to the left with the door with a 1 UP Heart on the left of it. In order to collect it, the player must get passed the door without ending the level ,then get the heart then go back to grab the key then bring it the door to end the level. This page was last edited on April 10, 2018, at 12:52.